Introduction: I went to a local record shop just hoping to look around and kill some time. 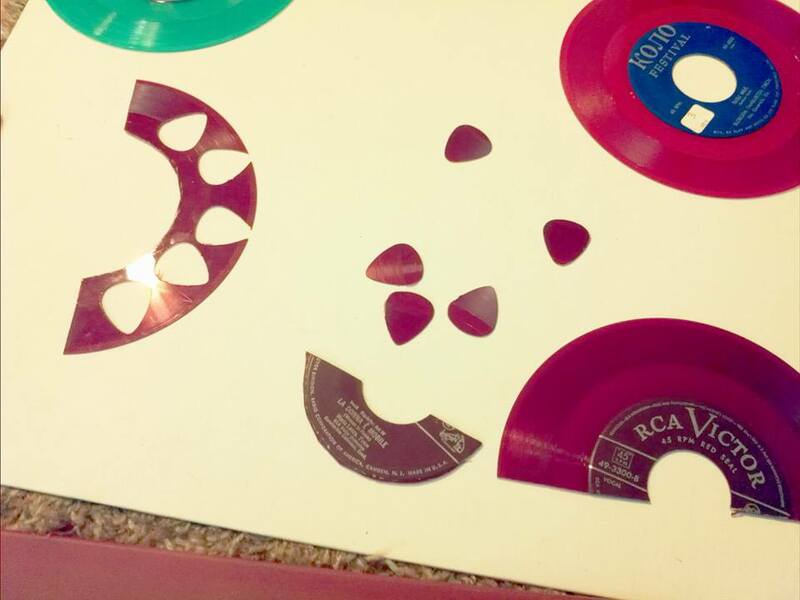 Before long I found the section of colorful 45 records and decided to take a chance and see if I could cut picks out of them. After a bit of trial and error, I figured out the best way to up them up. Then I started to sand the edges and polish up the picks with an eye glass cloth. I bought 3 different colors of records and plan to turn them all into guitar pick art. I wanted to cut mini circles from records to make mini record rings. 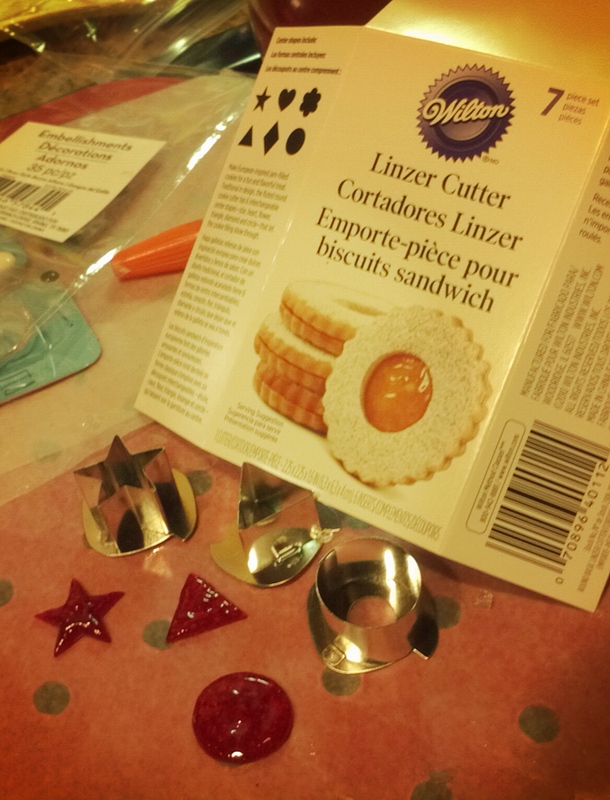 I found something pretty much perfect: Linzer Cutter cookie cutters. The shapes are about the size of a nickel. They are metal and perfect to cut out of a heated vinyl record. I tried them out and they worked great! Thankfully once it's cut it is easily pressed and popped out from the record when it's cooled. These are fantastic and met all my criteria for making shapes from records. For instance, cutting them out with an x-acto knife or scissors is tricky and time consuming. These small metal cookie cutters worked great. For this project I used a bottle cap to press through the heated record like a cookie cutter. I filed the edges, which ended up being a long detailed part. It ended up being about the size of a nickel and I actually used one to make it as round as possible. I first tried to paint a circle in the middle but doing all these circles proved to be tough. So I put a reinforcement label in the middle and painted it gold. And in the center I put a shiny black embellishment. I pretty happy with the end result despite it being my first attempt at making a record ring made from a record. Note: Although it might seem like melting vinyl would give off fumes, in my experience it doesn't. It does give off a slight odor, but nothing strong or chemically smelling like one might think. 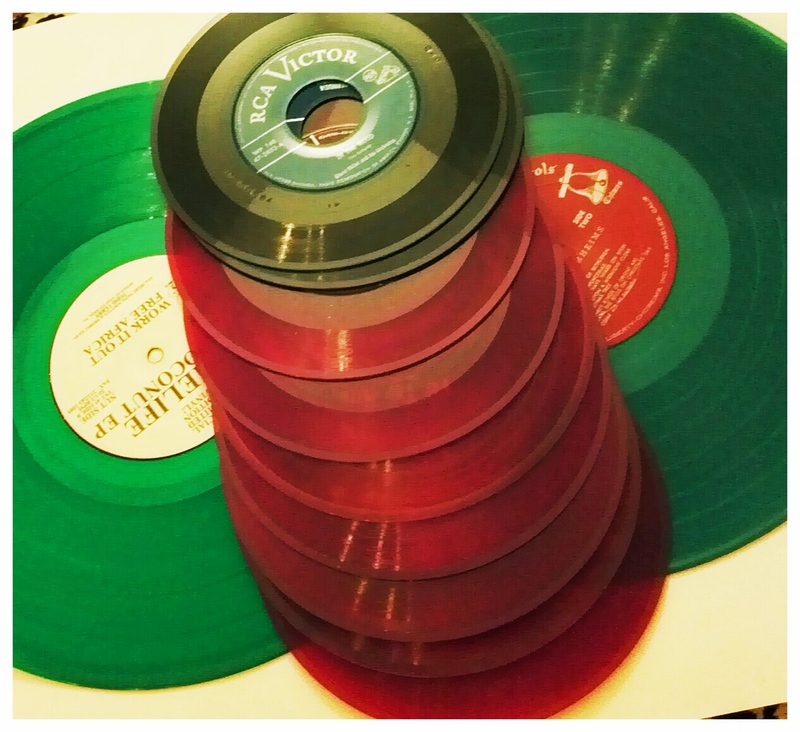 Because any old record wont do, I recommend colorful "RCA Victor" 45 records because they are vinyl and not plastic. Note that large LP regular sized records don't work as well because they are normally too big to fit on a cookie sheet. Not to mention they are significantly thicker and harder to cut, but not impossible! Wipe off records with a damp cloth to remove dirt. Often times you'll acquire records that are old and kept in dust boxes. After that cut the records in half before you heat or cut them, this makes them easier to work with. If they're too thick to cut, put them in the oven for a few second to make it easier to cut. From here you can cut them with your Pick Punch or scissors to get some shapes. Or continue heating them in the oven when melting layers. Record melting in the oven process: Preheat oven to 300 degrees, keep in mind that this is the kind of project you need to babysit. The melting/softening of the record to cut takes only a matter of minutes. After 2-3 minutes go by (not forgetting to check in often) they should be soft enough cut into shapes. This may sound obvious but: they will be hot. Use gloves or mittens to handle them. Oven mitts work too, but they are too bulky to handle records and cutting them. Use the oven mitts to remove the cookie tray with the record, then use smaller gloves to handle the record. Work quickly. 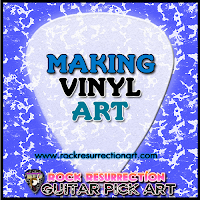 You have at most a few minutes to mold or cut the vinyl record. Recommended materials are metal mini cookie cutters for cutting shapes, or molding pieces to a wooden rolling pin. Do not use plastic or anything that could melt or wrap if exposed to heated records and a hot cookie sheet. Use metal and wood only. Let pieces cool completely before you turn them into anything. Records should pop off easily from sheet or will come off with a spatula.